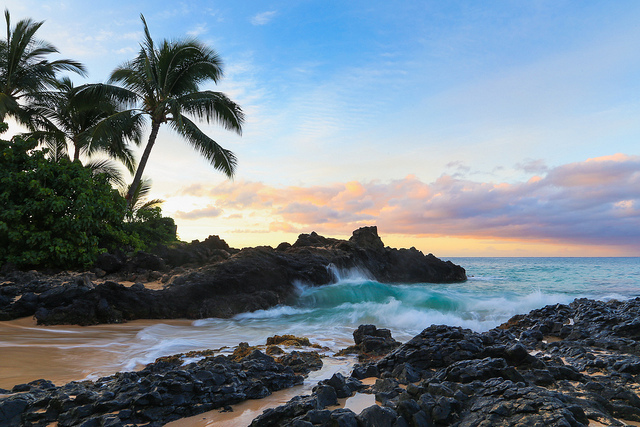 The state of Hawaii is actually made up of eight different islands, Niihau, Kauai, Oahu, Maui, Molokai, Lanai, Kahoolawe, and the Big Island. Those islands are actually the tops of a mountain range submerged under the water, and it’s actually the biggest mountain range in the world. The islands were formed when the volcanoes erupted many thousands of years ago. Hawaii is actually a lot more isolated than you might think, it is thousands of miles from any other population including China, Japan, California, and the Philippines. Hawaii is pretty big on the growing and exports. It is the only state that grows coffee, and it grows so many pineapples that it’s responsible for over a third of all the commercial pineapple supply in the entire world. The Big Island harvests more macadamia nuts and orchids than anywhere else in the world. Each island of Hawaii has its own interesting facts to know as well. Oahu for example, is home to the city of Honolulu, which by border size is the largest city in the world. Honolulu technically covers 1,500 miles and many other smaller islands within the state. Oahu is the most popular island as far as tourism goes. The Big Island is actually the youngest out of all the islands, but it is twice the size of all the other Hawaiian island…combined! It was the first one to be discovered by the Polynesians. The mountain Mauna Kea is the tallest in the world when measured from the ocean floor. The Big Island is also home to more scientific observatories than anywhere else in the world. The lava fields of Mauna Loa were once used by astronauts to train for landing on the moon, since the cooled lava bears a resemblance to the moon’s surface. Hawaii is the only state in the nation that experiences an increase of area since the volcanoes are still active and erupting. It’s also the state in the U.S. to contain natural rainforests. There is only one snake that is found in the wild in Hawaii, and it was thought to have been brought over in the 1920’s from the Philippines when some soil was transported to landscape a school grounds. Mosquitos were also brought over the to the island, as stowaways on a ship. These days most of the birds in Hawaii are in danger of becoming extinct, and they have lost more species than any other state. Surfing was technically invented in Hawaii, by the Polynesians that discovered and inhabited the islands many years ago. The makeup of ethnicity today in Hawaii is interesting because everyone are minorities. The average projected lifespan of people in Hawaii is longer than any other state, with an average life of 79.8 years. The Hawaiian society was built mostly from an oral culture as opposed to a written one, so storytelling through verbal means as well as through traditional dance was and is still very important. And don’t even think about taking volcanic rocks from the island. Myth goes that it makes the goddess Pele very angry, and so many people feel the curse to be real enough that they mail back stolen volcanic rocks to the park rangers to get them out of the space. I know someone who took rocks from the island and felt cursed, that is true!!! !